Just click on the link and buy it. Seriously. I find myself ordering it for other people (guys and girls alike) as gifts. One such person took the hand soap and used it as shower gel. Daily. That's how good it smells. With the holiday season approaching, the scent of pine is everywhere. So embrace it. 2) The amazing pine scent lingers. 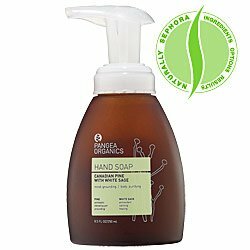 4) I have become loyal to Pangea Organics products. If this were a blog about skincare, I'd elaborate.